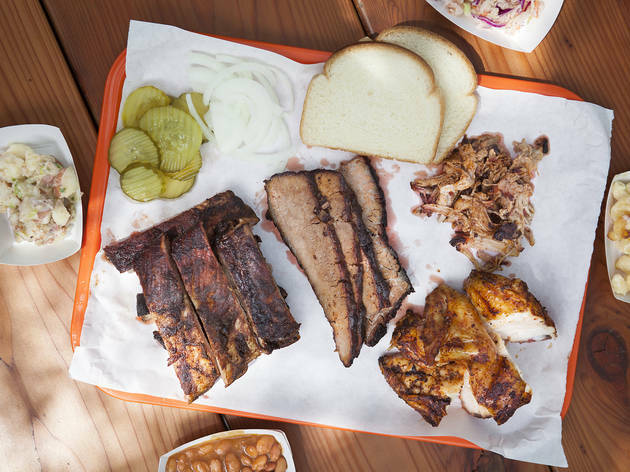 Memphis, Kansas City, Texas—no matter which style gets you hot and bothered, here’s where to find the best BBQ in L.A.
There’s BBQ and then there’s BBQ—you know, the kind that leaves you licking your sauce-drenched fingers as a pile of ribs picked clean is all that remains on your plate. 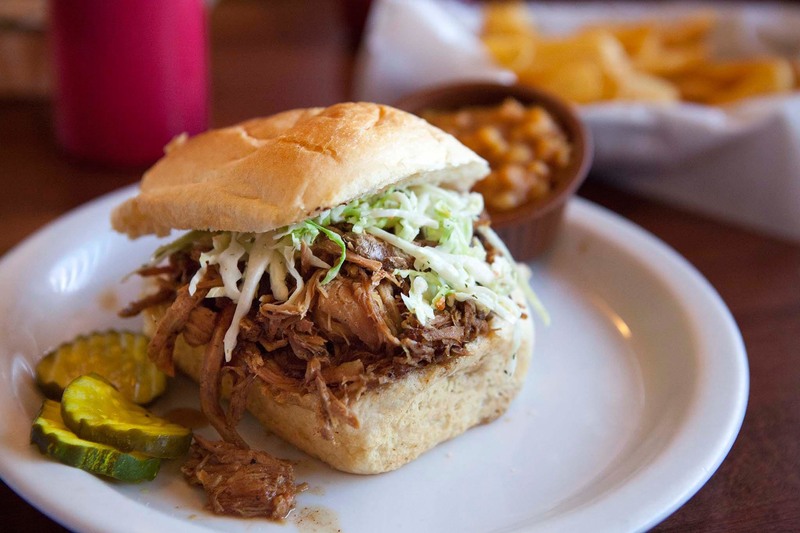 Die-hard BBQ fans will argue for days on end about summer BBQ essentials, why Memphis has the best pulled pork over Texas, or why Kansas City makes better brisket than the Carolinas. But here in Los Angeles, we have a great mix of all four (not to mention stellar Korean BBQ). 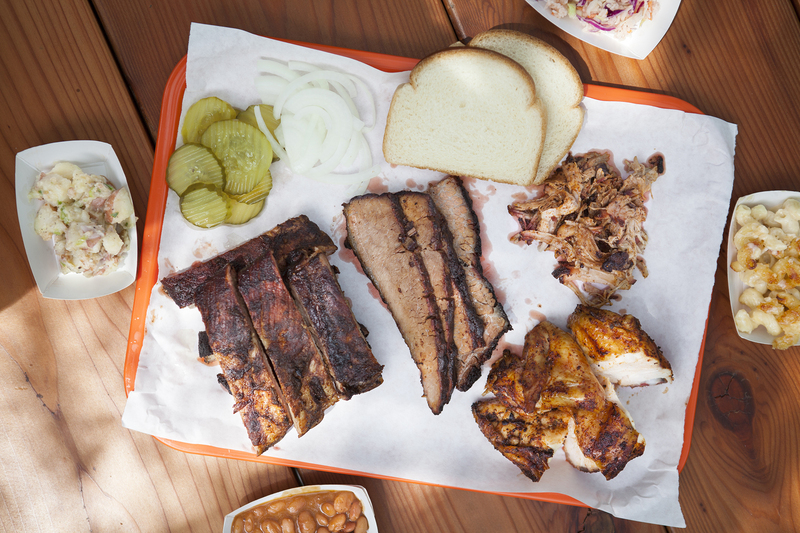 Despite the noticeable influx of BBQ spots in L.A. the past few years, there is still an ongoing debate as to whether this city has legitimately great barbecue. This, of course, is as subjective as what real barbecue should taste like and what region delivers the best of it. 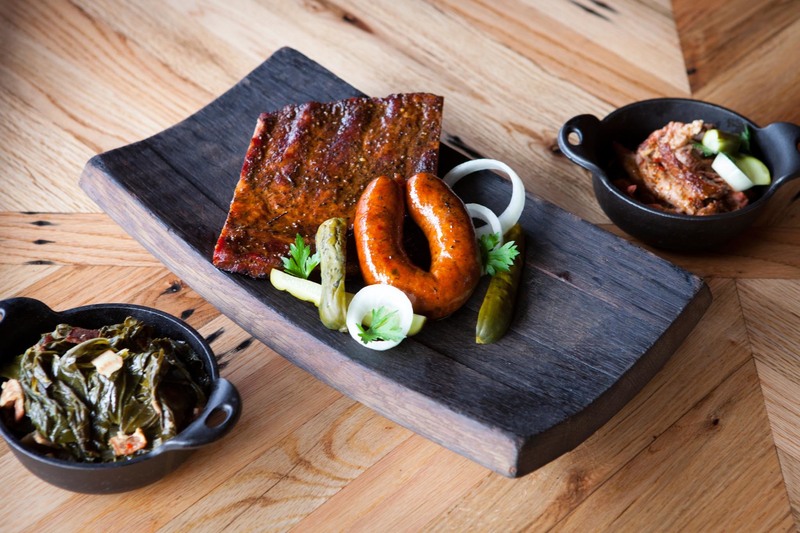 Maybe what is happening in L.A., then, is that BBQ is becoming more inclusive—not sticking to a Carolina or Texas style, but instead encompassing all of the dominant ‘cue regions, adding craft cocktails to the menu and serving it all in a rustic-chic setting. 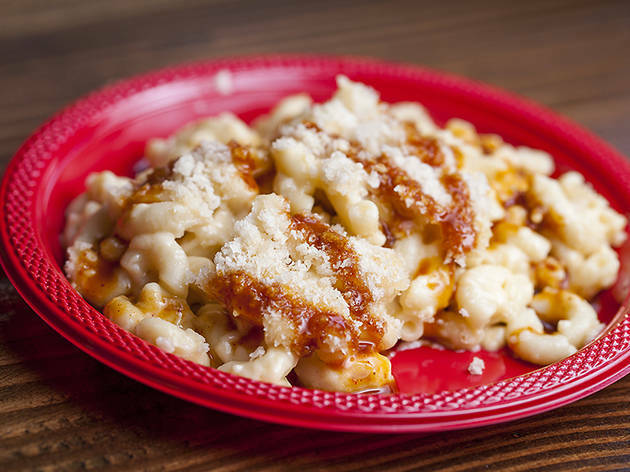 And all without breaking the bank; some of the best cheap eats in the city are hole-in-the-wall BBQ spots, where you can wolf down a plate of ribs, baked beans, mac and cheese and a slice of key lime pie for less than $20. 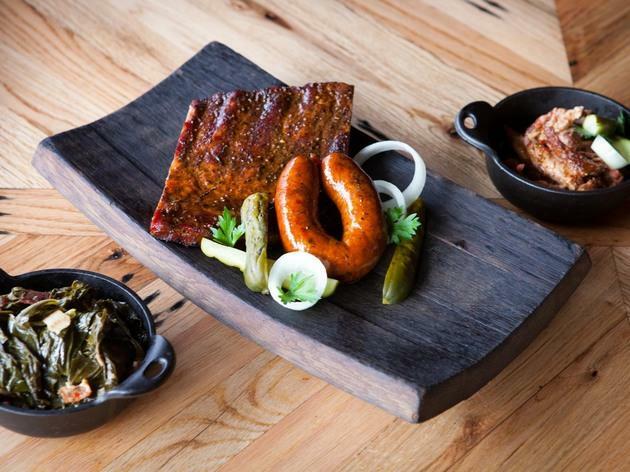 From Compton to South Pasadena, here are our picks for L.A.’s best BBQ. Barrel & Ahes BBQ is inclusive—it doesn’t stick to just a Carolina or Texas style, but instead encompassing all of the dominant ‘cue regions, adding craft cocktails to the menu and serving it all in a rustic-chic setting. One particular “snack,” called the Best Damn Chick’n Sandwich Ya Ever Had, comes pretty close to living up to its name. These are prime picnic sandwiches—crispy fried chicken and dry coleslaw, jalapeño, and pimento cheese clasped within a poppy seed bun. A bite of fried chicken, a forkful of braised greens—sweet, and with chunks of flavorful pork rinds—and you’re set. The spare ribs are sauce-drenched, tender and fatty in all the right places. Craving some serious eats with your booze? 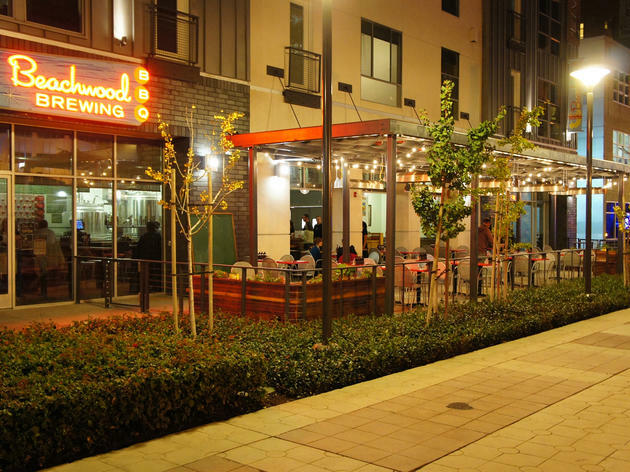 Check out Beachwood Brewing and BBQ for 22 rotating taps of craft beers and a menu boasting everything from ribs and pulled pork to brisket, all dry rubbed and slow smoked with plenty of sauces on the side. More importantly, perhaps, is the spot’s absolute dedication to pairing the food with quality beer, both from the on-site brewhouse and outside well-known breweries. With your smoked meats, try the Hops of Brixton, a well-balanced Extra Special Bitter brew. 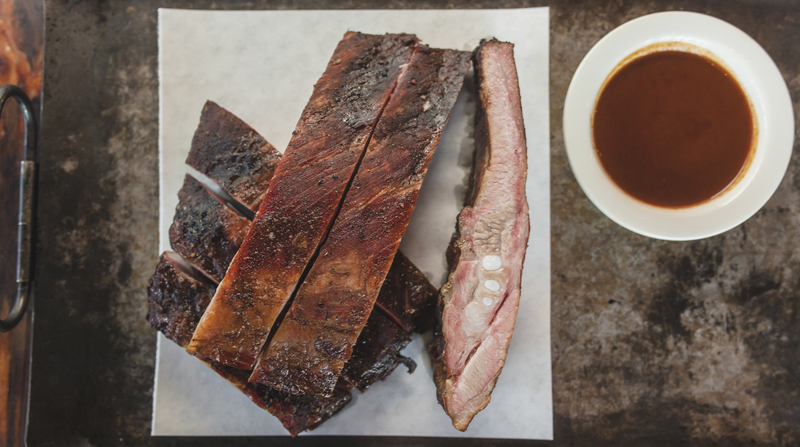 Patience is a virtue at Bludso’s BBQ, the famed barbecue hot spot that specializes in Texas-style ribs, brisket, chicken and anything else you can think to throw in a smoker. The lines can be long (though not as tedious as the original Compton location). But good things come to those who wait. Founder and Texas native Kevin Bludso’s brisket falls off the bone; in the Texas Sampler, a pile of ribs, sausage links and brisket lies under a slathering of sweet barbecue sauce. Choose from side dishes like potato salad, baked beans, coleslaw, greens and rich mac and cheese, or save your appetite for dessert, where banana pudding is spooned out into styrofoam containers. It’s a little bit of Texas… straight outta Compton. It’s a good sign when you step outside of your car in the parking lot of Dr. Hogly Wogly’s Tyler Texas BBQ and are immediately hit by an olfactory wall of braised meat. Round the corner past the AstroTurf patio and step inside this Van Nuys treasure, where wood-paneled walls and fast-talking waitresses who call you “hun” transport you to the middle of America. 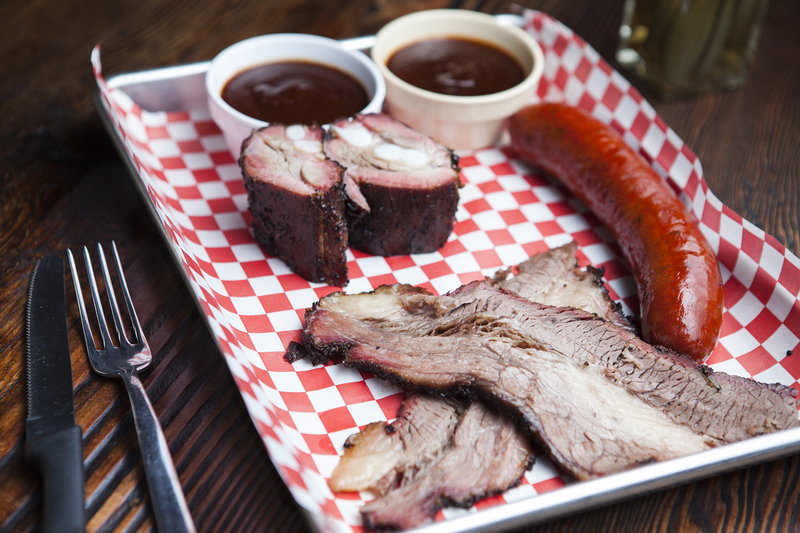 As its name suggests, Dr. Hogly Wogly’s is all about Texas BBQ. 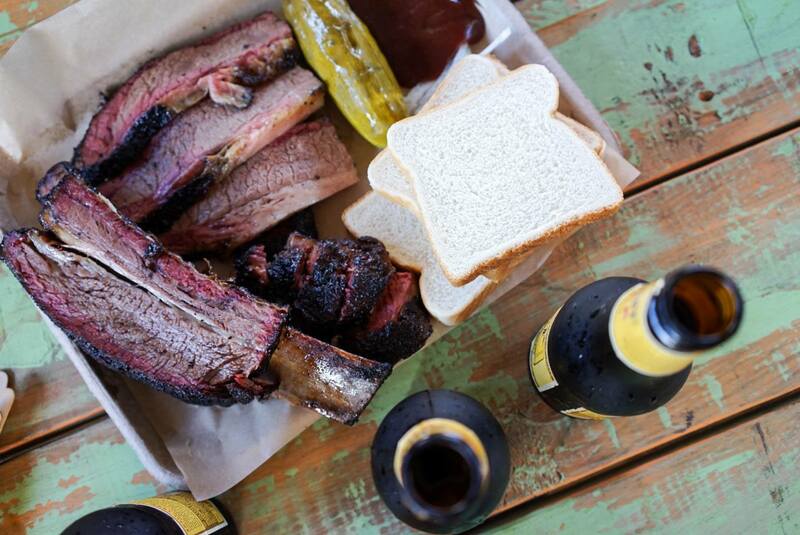 You can order items á la carte or go big with the two- and three-meat combos, but make sure you go for the brisket. The fall-apart beef comes with a sweet or hot sauce (ask for both); the combos also allow for two side dishes. 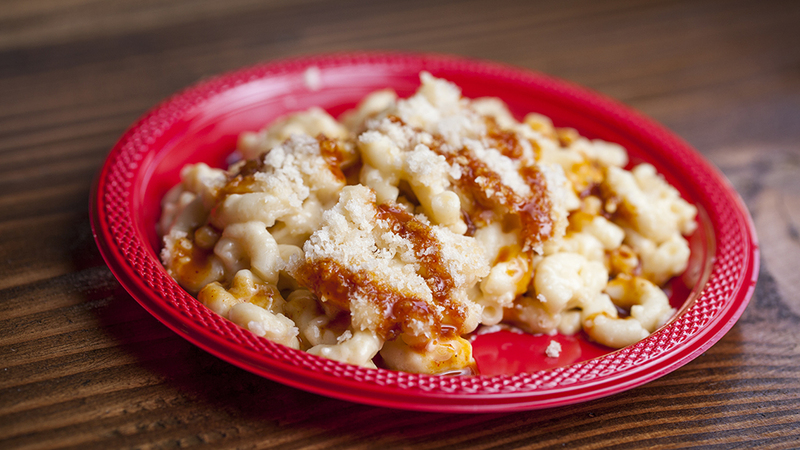 Fan favorites include the baked beans (which are out of this world) and the coleslaw. How, you ask, is it possible to eat everything on your plate? Cram it all into a buttered roll—the brisket, the beans, the coleslaw, the sauce—and take a bite. It’s just what the doctor ordered. 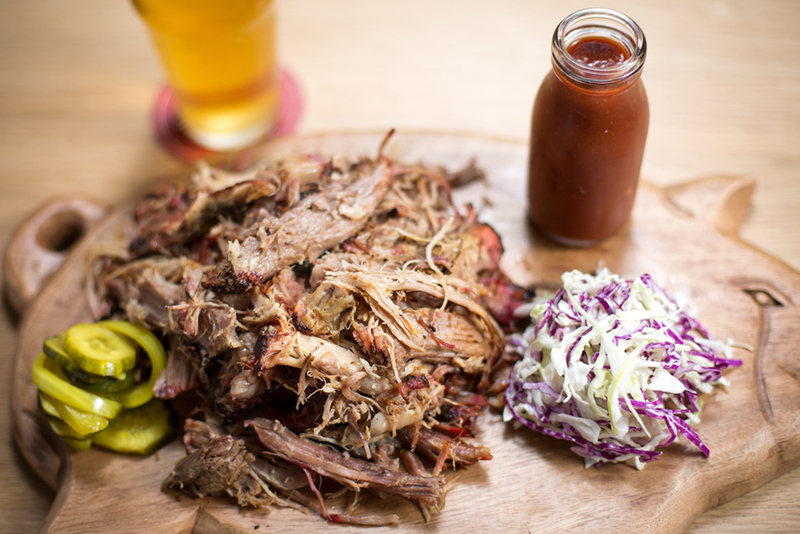 Great BBQ doesn’t always have to come from a hole-in-the-wall shop in the middle of nowhere. 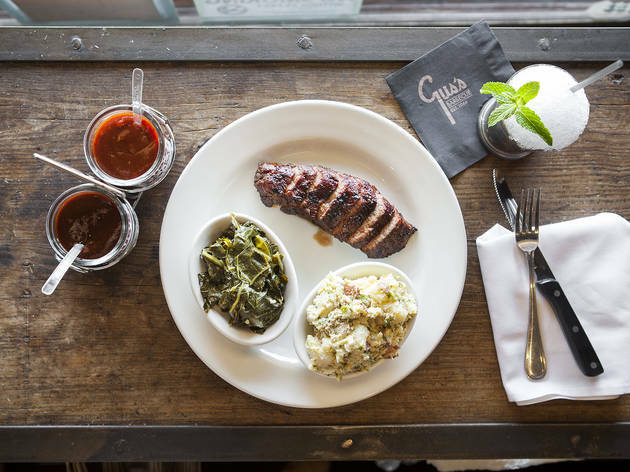 At Gus’s BBQ, a South Pasadena landmark that’s been around for over 70 years, you might find some of the best cornbread you’ve ever had. Arriving in a cast iron skillet, the bread is both creamy and crumbly, with a heavenly sugar glaze on top that is perfect for pairing alongside Gus’s St. Louis spare ribs. Or maybe you’ll go for the Texas brisket, smoked for 16 hours using pecan wood. The tender meat is served with your choice of two sides—the braised greens are killer with a little hot sauce on top, while the mac and cheese is made with truffle oil, bacon and four different types of cheese. But the real star is the boneless Southern fried chicken, a juicy slab of meat that is enveloped in a spicy crust. You’ll take a bite and declare that this chicken is life-changing. 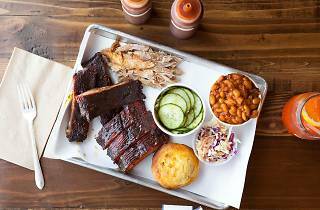 Sure, you may be sitting in a comfy booth in a quaint suburb of L.A., drinking Southern sangria out of a mason jar, but good BBQ is good BBQ, no matter where you are. 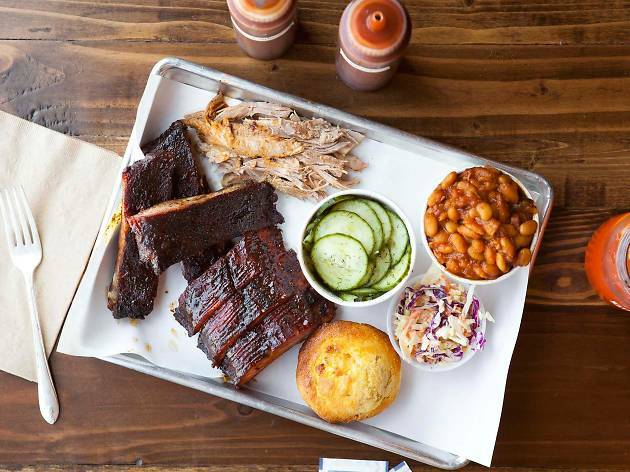 With locations in both Santa Monica and Culver City, Holy Cow BBQ has brought some serious ’cue to the Westside. There’s a hefty selection to choose from here—meat and sides, greens and desserts, combos, and a section called “between bread,” which solely features sandwiches. With mason jars full of perfectly tart lemonade (is there a better way to wash down BBQ, aside from sweet tea? 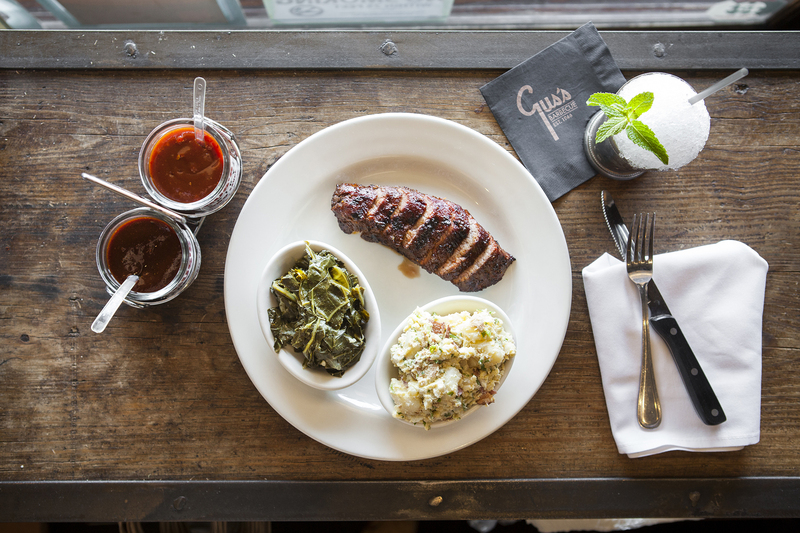 ), diners can dig into small bowls of collards, mac and cheese and slaw before starting in on the meat. 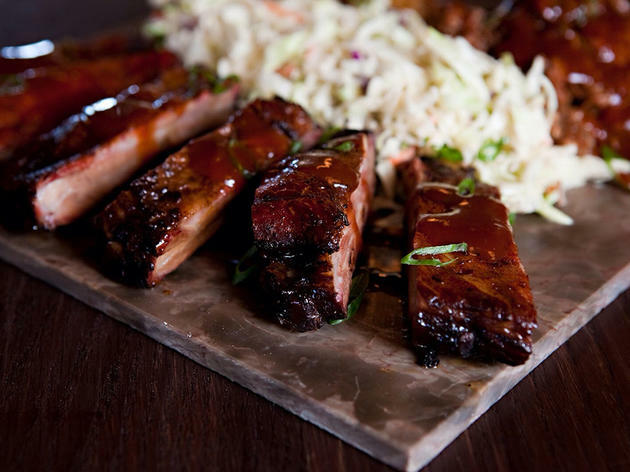 The baby backs ribs are hand rubbed and boast a beautifully caramelized crust, while the pulled pork is served up Carolina-style—more specifically, the South Carolina Midlands, where the use of Carolina gold sauce is the standard. The best way to finish your meal: a piping hot peach crumb. At Horse Thief BBQ, Angelenos are getting schooled on the ways of low-and-slow cooking, namely central Texas-style BBQ. Native Texans Wade McElroy and Russell Malixi met at school in Austin, and have brought their self-taught ’cue chops (and a trip of hickory smokers and elevated ingredients) to DTLA’s historic Grand Central Market. 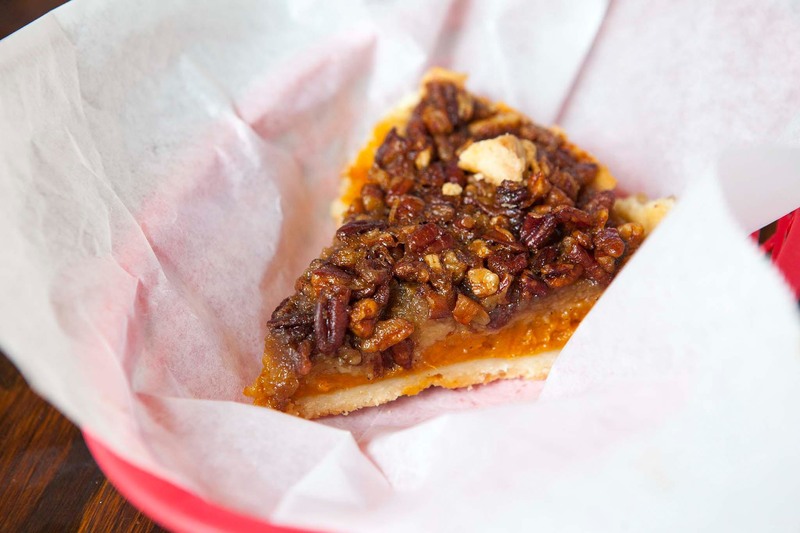 With no more than a queue-and-order window and alfresco communal picnic tables, Horse Thief BBQ serves the local lunch and dinner crowd until the food runs out. As any good Texan would know, brisket is the star here—dry rubbed and smoked for 15 hours over oak wood. Pork fans can get their grub on pulled pork and pork ribs, while poultry lovers can sink their teeth into brined and smoked chicken (Mary’s organic, no less). A complete meal is packed on with the proper white bread, dill chips, chopped raw onions and fixings of blue cheese and bacon potato salad, cabbage and jicama slaw and heirloom baked beans. And with Grand Central Market’s recent beer and wine license, you can now pair your spread with a cold brew. Cheers to that! 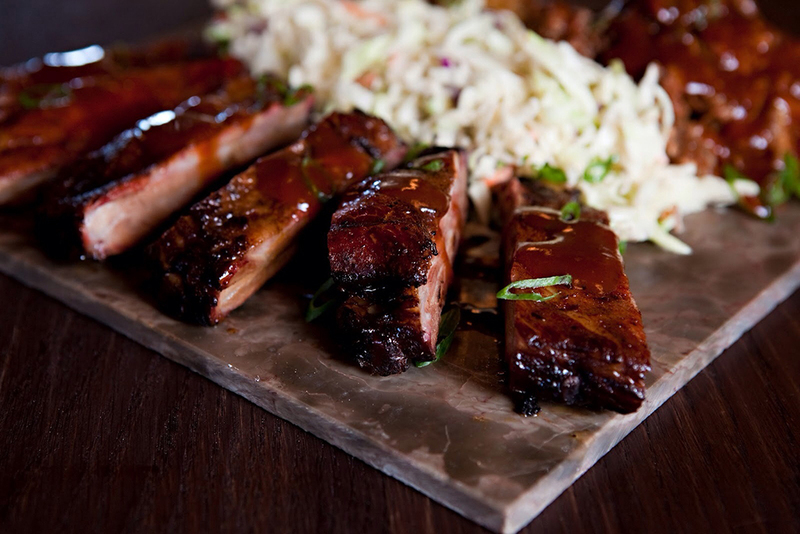 The very nature of BBQ screams ’Merica, but at The Hungry Pig, a little bit of Asian flair goes a long way. Owner Eiddy Pennson comes from a background in Thai cuisine, and instead of leaving behind curry and basil for a life of Memphis-style ribs, she took a little bit with her. Yes, there are the baby back ribs and the pulled beef brisket, the BBQ chicken and the pulled pork sandwich. 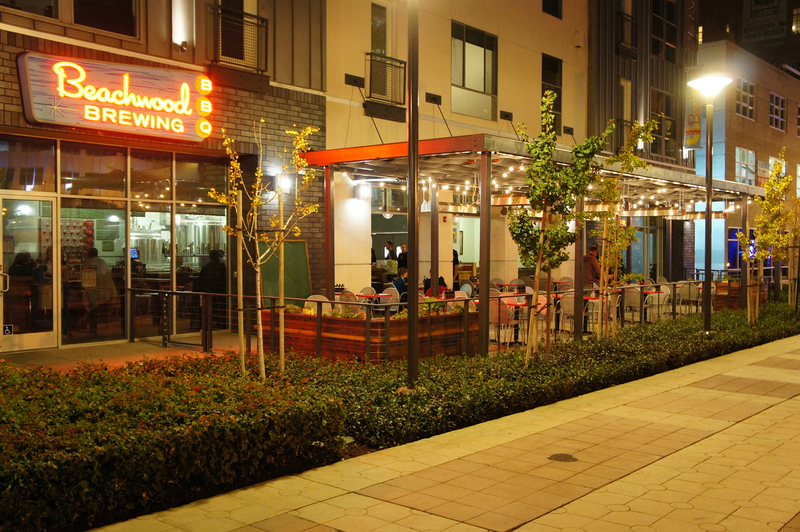 But there is also pork belly and chicken satay, curried potatoes and spicy eggplant salad, all of which can be enjoyed in The Hungry Pig’s spacious seating area if you’re not a fan of the traditional find-a-spot-in-the-parking-lot strategy that some of LA’s other BBQ restaurants employ. And if you want to take some of that brisket home, you’re in luck—most of the beef, chicken and pork are sold by the pound as well. 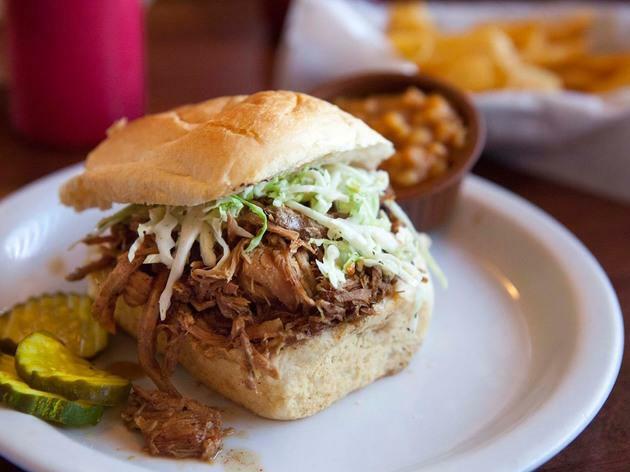 There’s a little something for everyone at JNJ Burger & Bar-b-que—some burgers, some sandwiches, pulled pork galore—but if you know what’s good for you, you’ll stick to the BBQ. 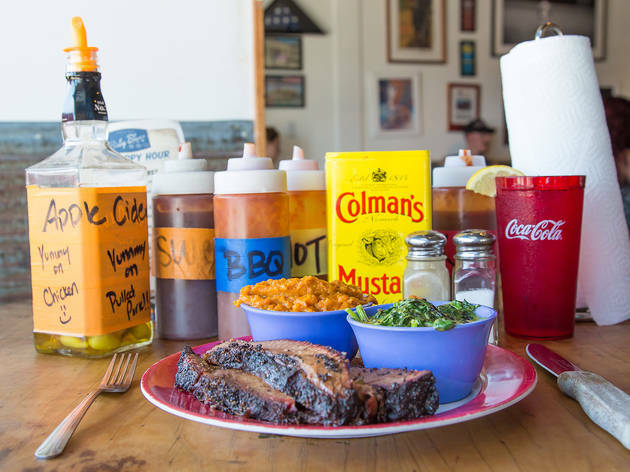 Operating out of an old-school shack in the West Adams neighborhood, JNJ offers Louisiana-style pork and beef ribs, hot links, brisket, chicken and more, with a smattering of sides (get the collard greens!). To order, head over to the BBQ side of the shack (yup, there’s a BBQ side and a burger side), then score a spot on the outdoor patio where you can take in the smell of oak, pecan and hickory wood wafting from the smoker. The beef ribs here are where it’s at; with a drizzle of hot sauce and a scoop of potato salad, you may just have a religious experience. 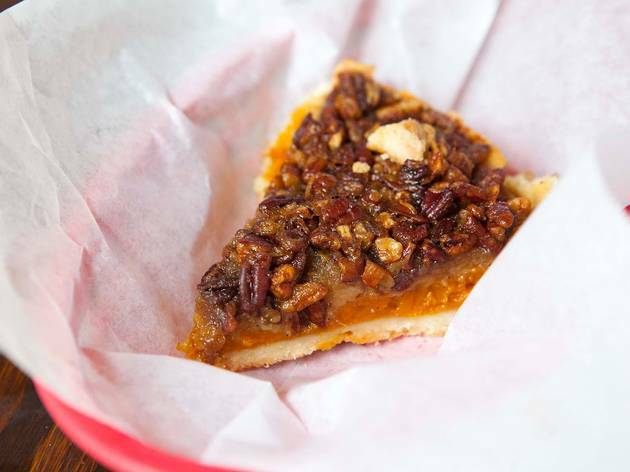 Make sure to save room for dessert, though: JNJ’s homemade sweet potato pecan pie is worth the trip on its own. Meat butchered on premise, wood-smoked, cut-to-order brisket, a pitmaster from Texas—Maple Block Meat Co. is checking off all the right BBQ boxes. Lunch and dinner options range from chopped pork shoulder to a whole free-range chicken with smoky skin. Before you even get to the entrées, smoked chicken wings appear under the menu’s snack column, small in size but packing a flavorful punch. 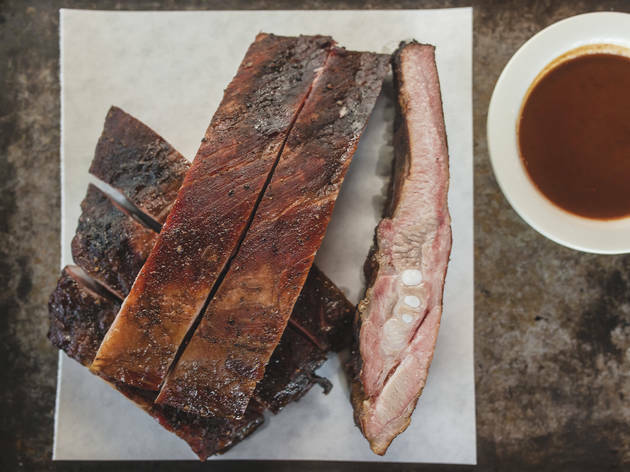 Other smoked meats include prime rib, pork belly, incredibly tender brisket and even smoked salmon, but the pork spare ribs are the standout choice: Sporting a beautiful rub, the ribs alone are worthy of sitting through 405 traffic. Owners Jason McDonald and Melanie Blair opened this Eagle Rock eatery in March of 2014, following the success of their catering operation—and they’ve been developing a steady stream of regulars ever since. Be warned: The shop is small and seating can be scarce, but the food is worth fighting over a table. 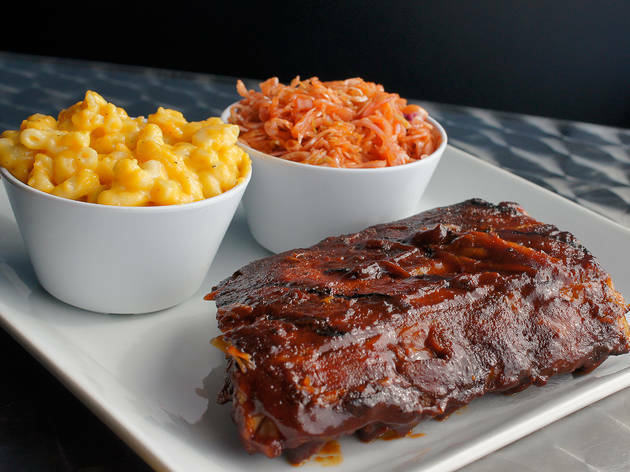 Come with a friend and share the Spence’s Platter of Pork, which includes baby back ribs, St. Louis-style ribs, pulled pork, two sides (their cucumber salad is a delicious and unconventional option) and cornbread—yeah, we know it’s a lot. 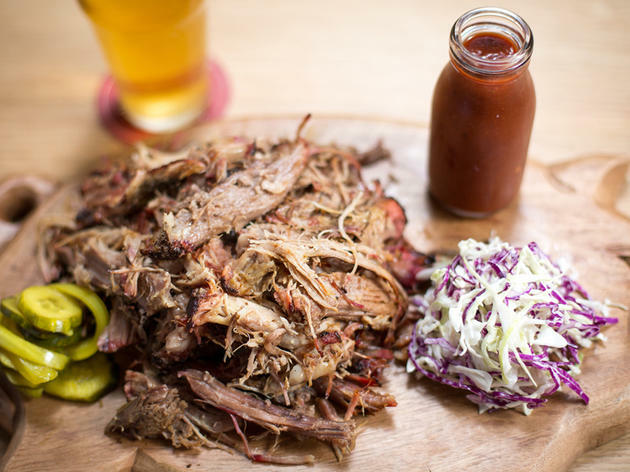 And unlike a lot of other BBQ restaurants in the city, the drink menu is just as stellar, with local breweries on tap, wine and the oft-raved-about lemonade. Stop by during at brunch for pulled-pork breakfast sandwiches. 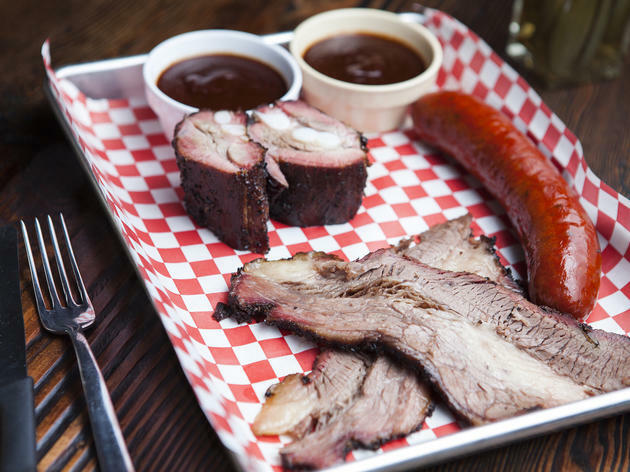 As you’ve probably figured out by now, Texas-style BBQ doesn’t only dwell in the heart of Texas—in L.A., you can find it if you look hard enough, and if look in the heart of the Arts District, you’ll find Pearl’s. 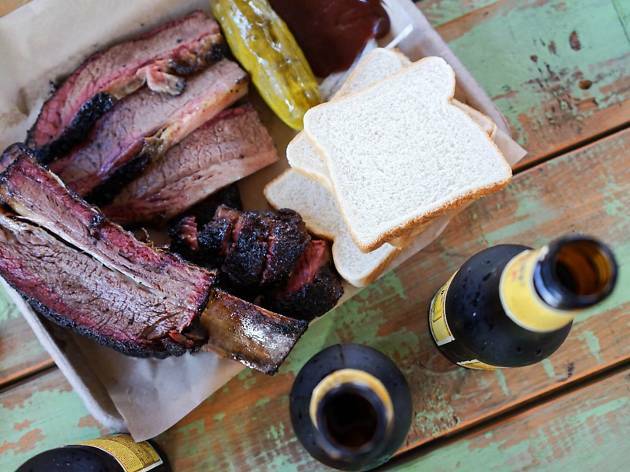 This spot slings brisket and 12-hour-smoked beef short ribs by the pound; hot apple pie; and smoked sausage out of an airstream trailer. Grab your tray—heaped with white bread, pickles and meat—from the trailer when they call your order, then grab spot at a picnic table under the tin roof. Wash down your hearty homestyle meal with a cold beer or some honey lemonade. Just be sure to get there close to 11am—after all, once they sell out (and they do), you’ll have to wait until the next day to come back and sate your cravings. 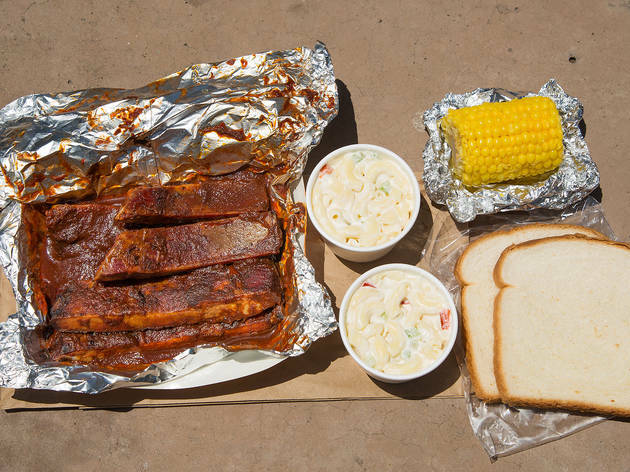 There are a few Phillips Barbecue locations—one on Crenshaw, one on Leimert and another on Centinela—and while longtime customers claim a favorite, they’re all serving up the same thing: legit BBQ. It may look a little sketchy from the outside, but that narrow corridor leading up to the counter fills up quickly with a lunch crowd waiting to get their hands on Phillips’ signature spare ribs. 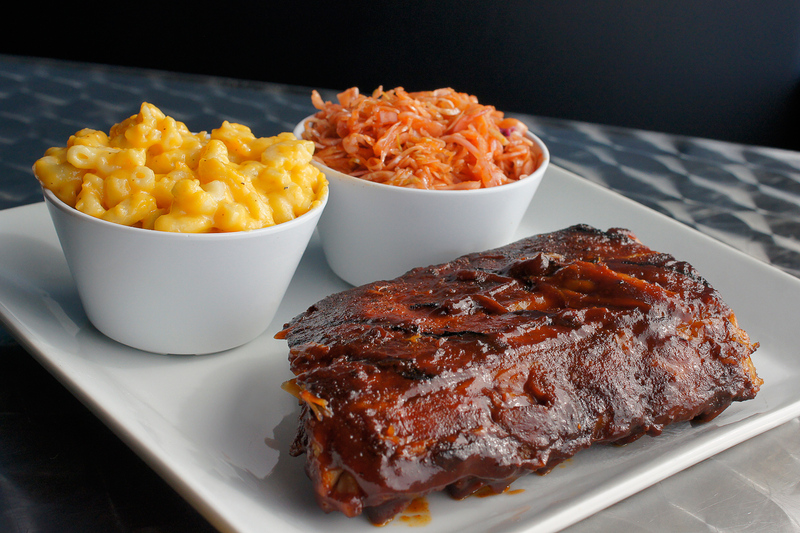 Tender and smoky, the ribs come with a sauce that ranges from mild to spicy (though your hands get dirty either way). There is corn on the cob and beans, potato salad and yams, and BBQ meat to the max. What is lacking? Enough chairs and tables, so be prepared to take your tinfoil of pulled pork and styrofoam containers of side dishes elsewhere. As the name suggests, this BBQ is underground—you’ve got to track down pitmaster Burt Bakman to get an invitation to one of his cookouts, or contact him for orders. Fortunately, Trudy’s is pretty active on Instagram, where you can stay tuned to photo posts and stories for collaborations and day-of and day-ahead notices of appearance. 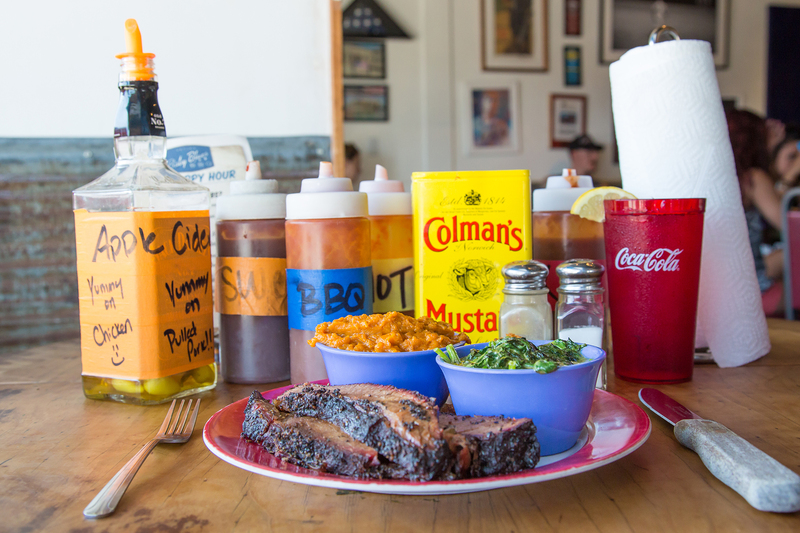 It can almost feel like a scavenger hunt, tracking down that juicy, spice-rubbed Central Texas-style brisket or those succulent racks of spare ribs—and feels like a total reward once you’ve found them.